Plants in Germany and the UK are bidding for the chance to make the Ampera. 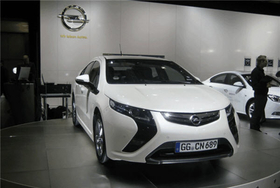 Opel/Vauxhall is on track to start production of the Ampera plug-in hybrid by the end of 2011, Andreas Lassota, the company's product marketing manager, said. "The development process is going according to plan," Lassota told the German press agency (DPA) during test drives of the Ampera in Dudenhofen, Germany. The five-door, four-seat Ampera is Opel's version of General Motors Co.'s Chevrolet Volt. The Volt launches in selected U.S. markets later this year. The Ampera and Volt will be able to travel up to 60km on power supplied by electricity stored in a 16-kWh lithium-ion battery pack. When the battery's energy is depleted, the cars' range is extended to 500km by a gasoline- or E85-fueled engine generator that provides electricity to power the electric drive unit while sustaining the battery charge. Lassota did not say when the Ampera will go on sale or give an indication of its price. Company sources say it likely will cost 40,000 euros (about $53,210), the DPA reported. Opel CEO Nick Reilly said the first Amperas will be built in the U.S. and imported to Europe but the company eventually plans to build the vehicle in Europe. Opel's factory in Bochum, Germany, and a Vauxhall plant in Ellesmere Port, England, are bidding to win Ampera production. "The first Amperas will come from the USA next year, but it is our aim to build the car in Europe as soon as possible," Reilly told German business weekly WirtschaftsWoche. "We have not yet decided where that will be."